You last visited Cynsations in September 2006! What is new in your writing life since then? Ah, yes! 2006. I was still adjusting to suddenly having time to write. Now I get up and start reading and writing. I've finished One Crazy Summer (HarperCollins, 2010), a middle grade novel set in 1968, that reunites three sisters with the mother who abandoned them and is now living in Oakland and involved with the Black Panthers. I've written a small play for the War Is... anthology, edited by Marc Aronson and Patty Campbell (Candlewick 2008). That inspired me to go back to "Captain Bowman," a longer play about a Vietnam vet. I've written a romantic comedy screenplay that BET has shown some interest in. My latest picture book, Bottle Cap Boys of Royal Street (Marimba Books, 2009), will be out this August. When a novel isn't working, I focus on shorter pieces until I can work out my problem with my original set of characters and larger story. It's hard to see issues when you're knee deep in them. But stepping away, doing something different always sparks the "aha!" moment. Then I'm back on the scent of the novel. Congratulations on the release of Jumped (HarperCollins, 2009)! Could you tell us, in your own words, a little about the story? An opportunity to talk about my story? Suddenly I'm twelve again. Okay. Jumped is a story that takes place in the span of one school day. Leticia, forced to take a make-up math class during the early pre-hours of school, cuts out, only to witness Dominique target the oblivious Trina for a beating at 2:45. If this were a Shakespearean tragedy, Leticia would torture herself pondering what to do. But alas, Leticia is concerned with gluing on her false fingernail tip and getting a good seat to the fight at 2:45. What first inspired you to write this novel? The rise of girl-on-girl violence. It's so out of hand that the newspapers have stopped reporting it. I'm always looking at girl culture, so this type of violence stands out to me. The statement the attacker seeks to make. How brutal. How random. But let's not forget the ever-present spectator! Most books deal with the bully and victim, but the spectator also plays a large role in promoting the prowess of attacker. I was more interested in the spectator point of view, so I leaned on Leticia a lot. It didn't matter. She couldn't care less. Getting through Jumped was a trek through the desert. I thought I'd have this thing wrapped up in six months, tops. It took two years to submit the manuscript to my most patient editor, Rosemary Brosnan. Thereafter, Jumped went through editing and was placed on the publisher's calendar for release two years later. So altogether, it's been four years from spark to print. What were the challenges (literary, research, psychological, and logistical) in writing this novel? Jumped was my hardest novel to write to date. These three girls kicked me at every possible turn. They were uncooperative. So many drafts. So many restarts. A ton of pre-writing that belonged only in a journal. Although the novel is slim, maybe even my shortest novel, I have a huge "unused" folder. So much had to be scrapped. I also had personal things going on. Managing my life without a full-time salary, my youngest daughter's unforeseen long-term hospitalization—she's now fine and back in school—and the passing of my father. I doubt that I liked either girl in the beginning. I doubt that I knew them. It was only when I began to respect who they were and what was important to them—regardless of my own thoughts—did I gain some entry. These are archetypal characters. The spoiled daddy's girl, the tough girl, the pretty girl who believes she's the pretty girl. I wanted them to be distinct, but I didn't want to delve so deeply into their lives and give the reader an out, to sympathize with them. I wanted the reader to see what's important to these girls but I didn't want to let any of them off the hook because of what's happening in their home lives or what has happened in their pasts. No cuing the violins. How do you balance your writing against the responsibilities of being an author (business, promotion, etc.)? Prior to Jumped, I had no time to think about promoting my books. My job let me off to do appearances, but to sit down and have a marketing plan for my books...it just didn't happen. My marketing plan was, "Gee. I think it's a good book. I hope they like it." I'm now more involved. I've done some online chats. I've sent out my postcards. I've introduced myself to booksellers. I run around to libraries and say, "Hey! I've got a book out." Last year I bid for and won the services of Through The Tollbooth. So they're always coming up with neat things for Jumped, like a book trailer on YouTube. Aren't those things incredible?! I love watching them. I'm giving out Jumped T-shirts to the first fifty who do a thirty-second video reading of Jumped as one of the girls. For the first time, I'll be writing up a discussion guide. But the record, I do believe the book belongs to the reader. That what they get from it is always right—even when they don't like the book at all. It's their book to not like. I feel a little false about leading the reader to topics and themes, but I'll give it a shot. Who are your first manuscript readers and why? I used to have the same two readers for my first four novels. Friend and teacher Rashamella Cumbo and author-librarian Monalisa DeGross (Donovan's Word Jar (HarperCollins, 2007)). These days, I pick readers by the questions I have about my portrayals. 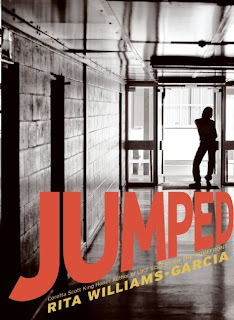 Two high school teachers read Jumped. They claim to have Leticia, Dominique, and Trina in their classes. If you could go back in time and talk to your beginning writer self, what would you tell her? My message to third-grade Rita would be to pay attention to tenses in grammar so her 50+ year old counterpart wouldn't have all this gray hair. Jumped had to be written in present tense for immediacy, but to not deal with the headache I felt coming on... "She's relaying events in simple past, now she's speaking of what occurred in her distant past, but she's also speaking of what would always happen but no longer happens, etc." I know the rules and caveats, but applying the proper tense isn't what I do naturally. But if I could tell my beginning-published-writer self something, I would say clearly and slowly, "Money is not a bad thing. When they offer lots of money to write a project, take it. That money will enable you to write the thing you love." What do you do outside the world of books? My father gave my brother, sister, and I boxing gloves when we were kids. I have a pair of bag gloves, and I go to the gym and hit the speed bag or body bag. I also knit. I used to dance, but not so much these days. One Crazy Summer (HarperCollins 2010) will come out next year this time. It's a novel for younger readers, say, 9-12, for a change. Right now I'm digging into a gaming novel. It's just time to step away from the estrogen and tap into boy-head. Having fun with this.